Team of Teams is on here. No Place to Hide is on here. The Executive Leadership Program of the US Naval Postgraduate School’s Center for Homeland Defense and Security (the “Nation’s Homeland Security Educator”) is designed to help senior local, state, tribal, and federal officials build U.S. capacity to defeat terrorism. Click the image for congrats from Ziva, McGee, Ducky, and Director Vance. The students in this prestigious program read a wide range of books (subject to change) in the course of their studies. Now you can, too, although you aren’t likely to get congratulated by the cast of the television show NCIS like they were. The program covers foundational aspects of homeland security and threats, the nature of threats, legal and cultural aspects of preventing and preparing for threats, collaborations necessary to effectively manage information sharing, threat recognition, protection measures, and plans in preparation for action. The books address a spectrum that includes left and right, practice and theory, philosophy and problem-solving. It’s a veritable reading rainbow. But don’t take my word for it. See for yourself. Watkins, Jane Magruder, Bernard J. Mohr, and Ralph Kelly. Appreciative inquiry: Change at the speed of imagination. Vol. 35. John Wiley & Sons, 2011. Ramo, Joshua Cooper. The age of the unthinkable: Why the new world disorder constantly surprises us and what we can do about it. Little, Brown, 2009. Harford, Tim. Adapt: Why success always starts with failure. Macmillan, 2011. Barrett, Frank Joseph, Ronald Eugene Fry, and Herman Frans Maria Wittockx. Appreciative inquiry: A positive approach to building cooperative capacity. Chagrin Falls, OH: Taos Institute Publications, 2005. Brenner, Joel. Glass Houses: Privacy, Secrecy, and Cyber Insecurity in a Transparent World. Penguin, 2013. Rosenzweig, Paul, and James Jay Carafano. Cyber warfare: How conflicts in cyberspace are challenging America and changing the world. Praeger, 2013. Lewis, Theodore Gyle. Bak’s sand pile: Strategies for a catastrophic world. Agile Press, 2011. Yoo, John. War by other means: an insider’s account of the war on terror. Grove Press, 2007. Greenwald, Glenn. No place to hide: Edward Snowden, the NSA, and the US surveillance state. Macmillan, 2014. Kellerman, Barbara. “The end of leadership.” (2012). Sagarin, Rafe. Learning from the octopus: How secrets from nature can help us fight terrorist attacks, natural disasters, and disease. Basic Books, 2012. McChrystal, Stanley, Tantum Collins, David Silverman, and Chris Fussell: Team of Teams: New Rules of Engagement for a Complex World. Penguin, 2015. Brafman, Ori, and Rod A. Beckstrom. The starfish and the spider: The unstoppable power of leaderless organizations. Penguin, 2006. Brannan, David, and Anders Strindberg. A Practitioner’s Way Forward: Terrorism Analysis. Agile Press, 2014. Epstein, Richard L., and Carolyn Kernberger. The pocket guide to critical thinking. Wadsworth Publishing Company, 2010. Brenner, Joel. 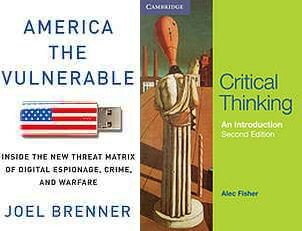 America the Vulnerable: Inside the New Threat Matrix of Digital Espionage, Crime, and Warfare. Penguin, 2011. Fisher, Alec. Critical thinking: An introduction. Cambridge University Press, 2011. And that’s just for the Executive Leadership Program. Want to see what the Master’s students read? Have at it. This article was written by Steven Polunsky for Inside Job and is not intended to represent the official position of anyone or anything other than the author. All other images courtesy NPS.The Inside Job team wants to make it easy for you to get our posts and share them if you like. We are part of the publication https://medium.com/homeland-security. Entered Medium as part of a team https://medium.com/homeland-security/inside-job-51b44463ef3c but current writings are my own or those of guests where noted.